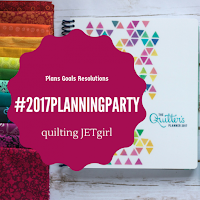 Yvonne @ Quilting Jetgirl is hosting the 2017 Planning Party. It's a chance to reflect on 2016 and think ahead to 2017. I did not make the blazer or Washi dress, but both are still on my list. 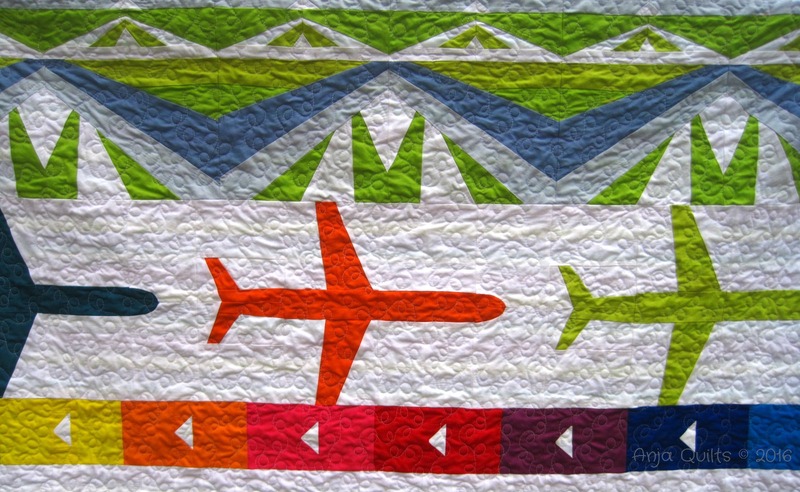 I participated faithfully in three of the monthly quilting clubs. The fourth one was not what I had expected, so did not fully participate. 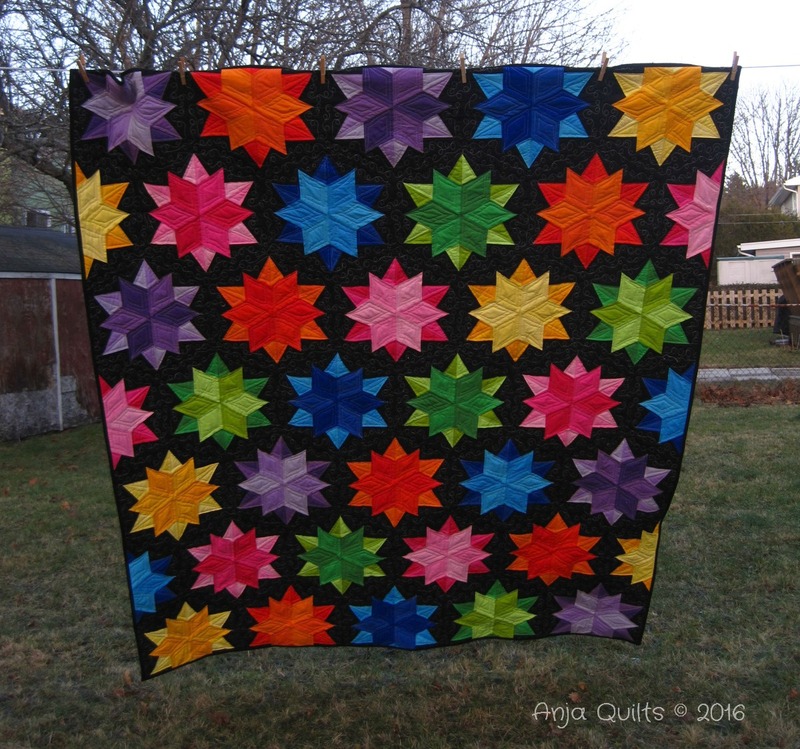 I quilted all nine quilt tops. I also made a lot of other projects throughout the year that were not on my list. So all in all, a successful 2016. Watch all my Craftsy classes and try new techniques. Organize my sewing room (and keep it organized). 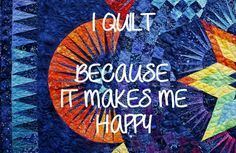 Make what makes me happy and continue to have fun quilting. This is the final Friday Finish I'll be posting about in 2016. And I'm ending on a high note! 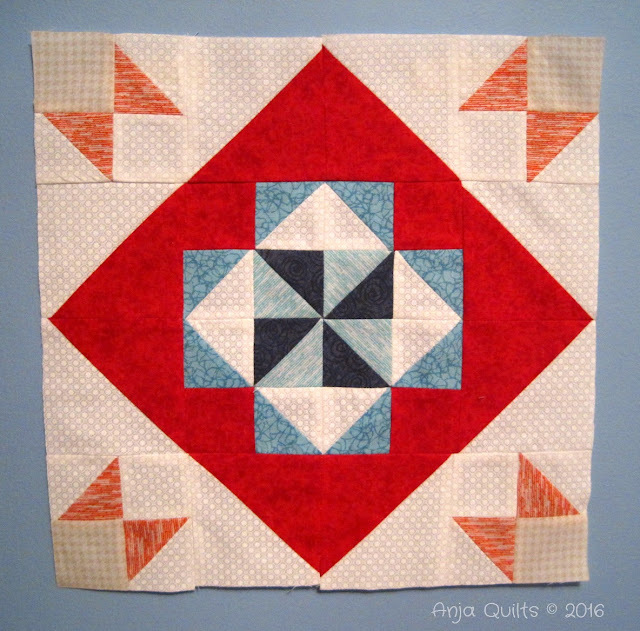 My Night Sky quilt has been a WIP for well over a year -- you can read my post from November 2015 here. 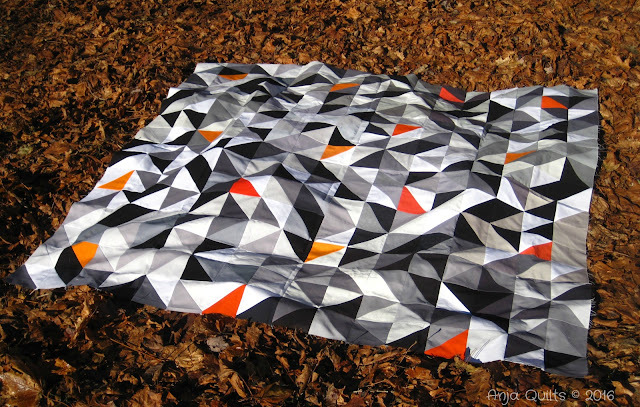 I love patterns by Jaybird Quilts, and this one was no exception. 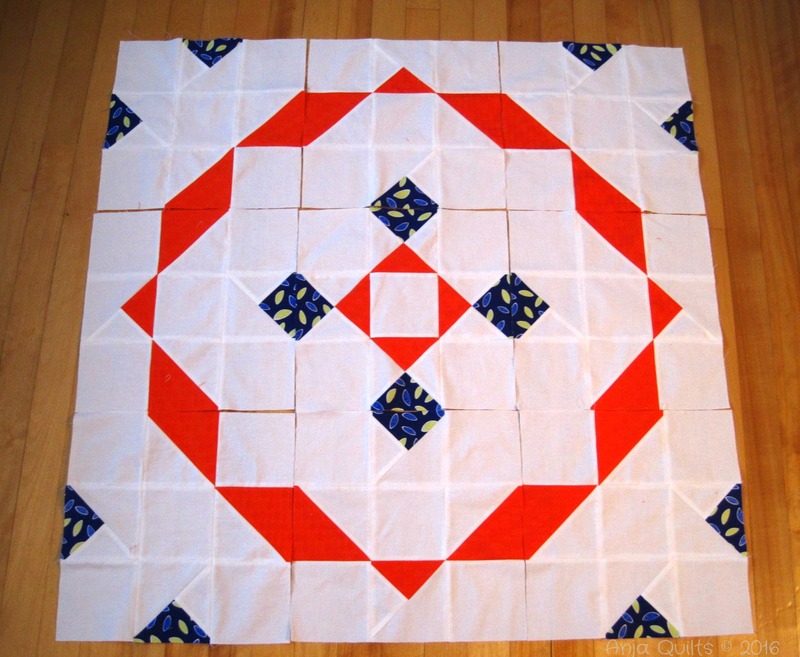 The top ends up with a pointed scalloped edge along the top and bottom (as shown below). 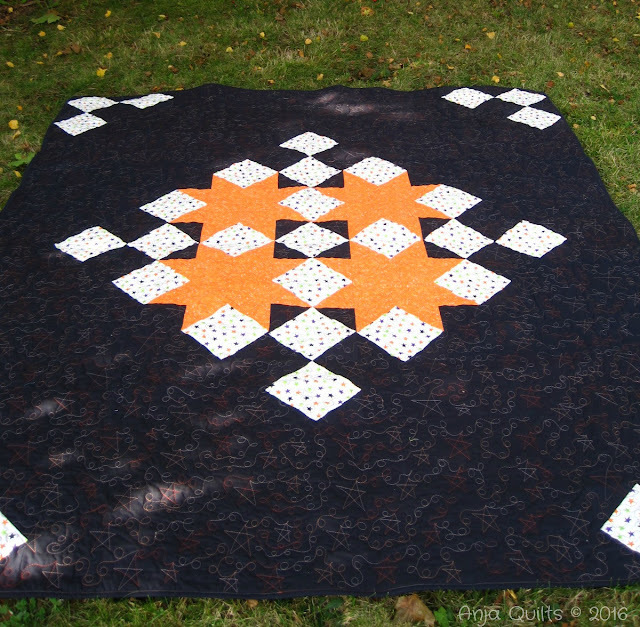 I had originally wanted to square up the quilt, or add more black background. But Dena @ No Frickin' Blog Yet convinced me to leave it. 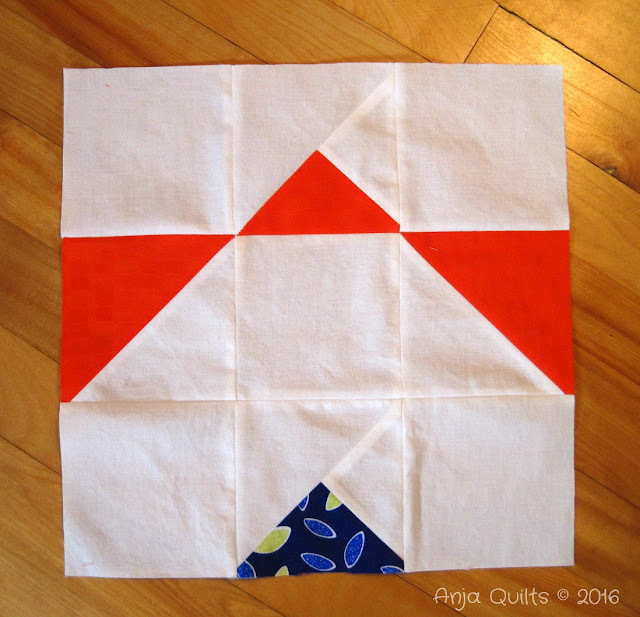 After I finished quilting, I was ill with the thought of having to make bias binding and then hand stitch the binding to the back. So in keeping with only doing stuff that makes me happy, I squared it up. And then Dena let me down again. 😊 My first thought was black binding, but sewing black binding on black background is hard on the eyes. 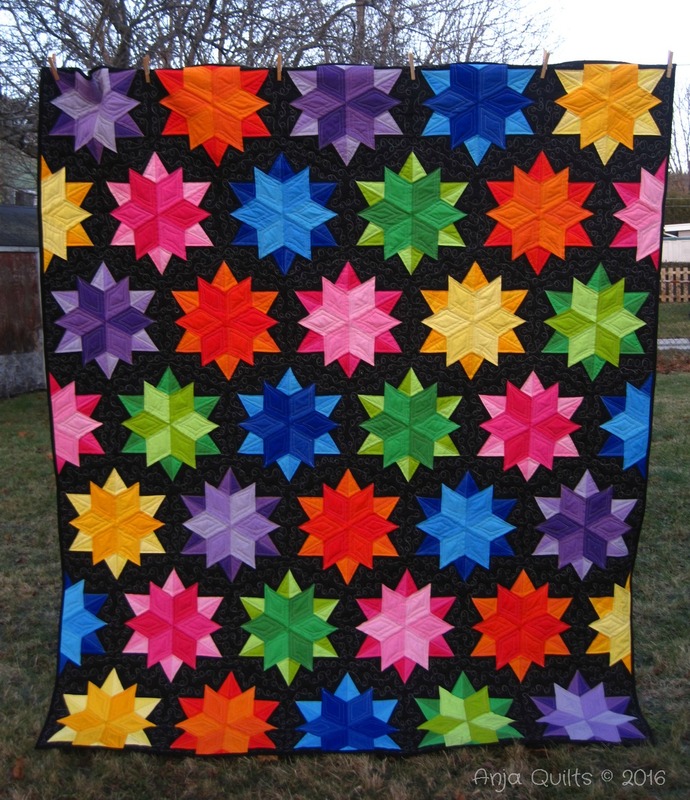 So I consulted with Dena again, certain that she'd say one of the colours in the quilt, or a scrappy binding. Oh no! She had to say black binding. But I did use black because it was the right thing to do. Here's a closeup of my attempt at dot-to-dot quilting. I used silver thread. My "longarm" is a Pfaff loaded onto a frame, so I only have a 6-inch quilting depth (5 inches when you get about three-quarters through the quilt -- the quilt takes up some of that space on the roller). 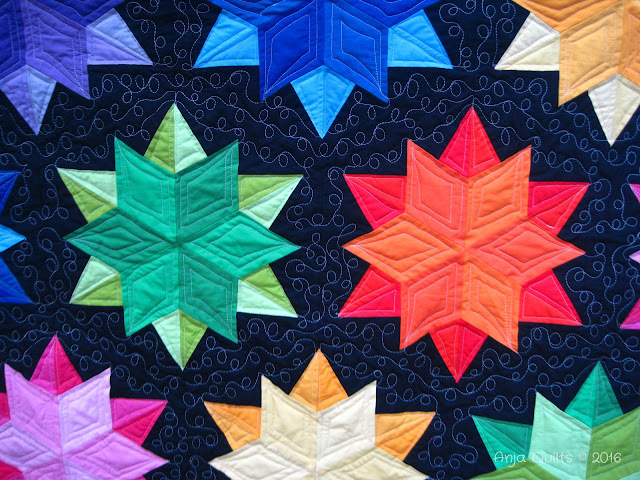 It was hard enough trying to do this design without adding the work and stress of having to change thread for every star. 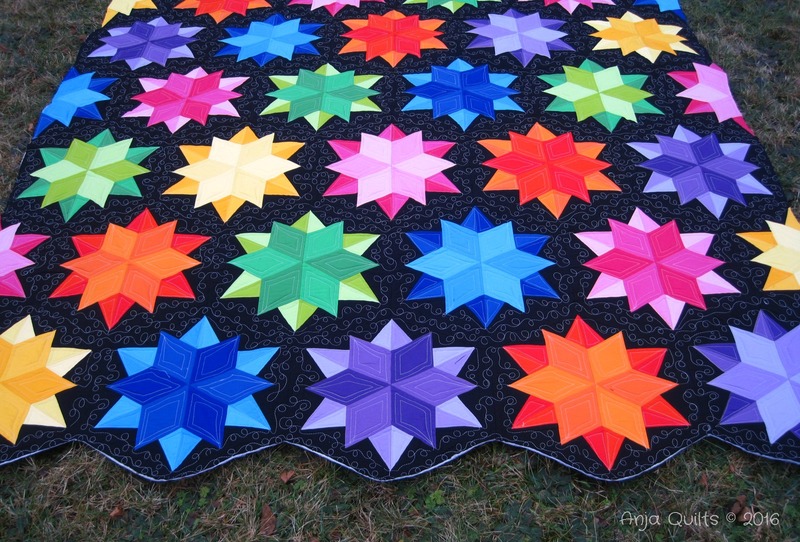 As it was, I had to do five passes (advancing only about an inch or so each pass) to quilt each row of stars. 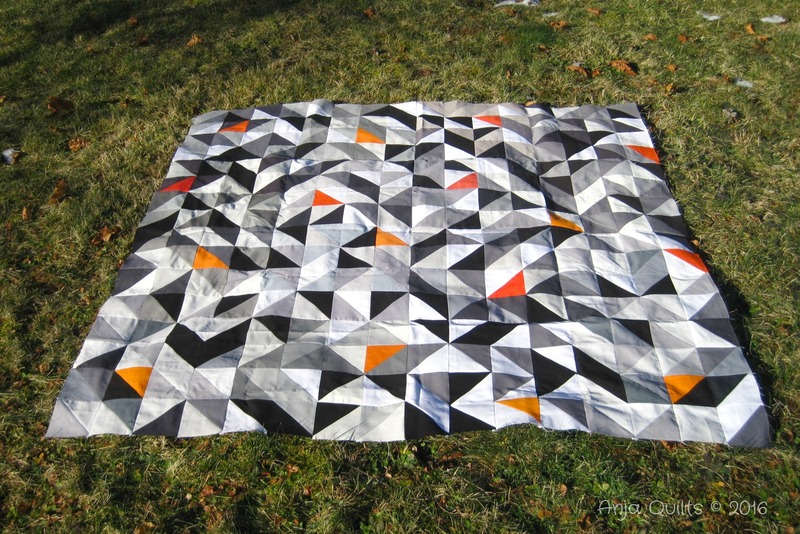 I stopped calculating how long it took to quilt, but my best guess is around 7 hours. It took two attempts to get photos today because it was so windy. 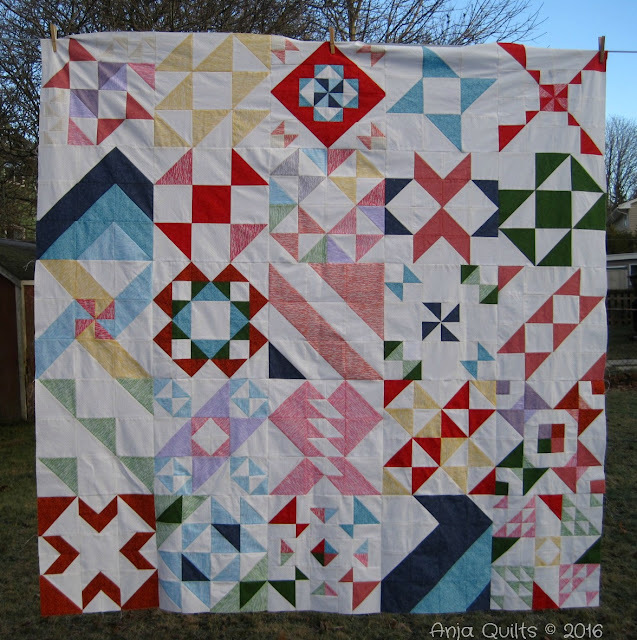 The first attempt, the quilt kept blowing around on the ground and blew off the clothesline. I got better photos on the second attempt, but I had to catch photos when the quilt blew back. 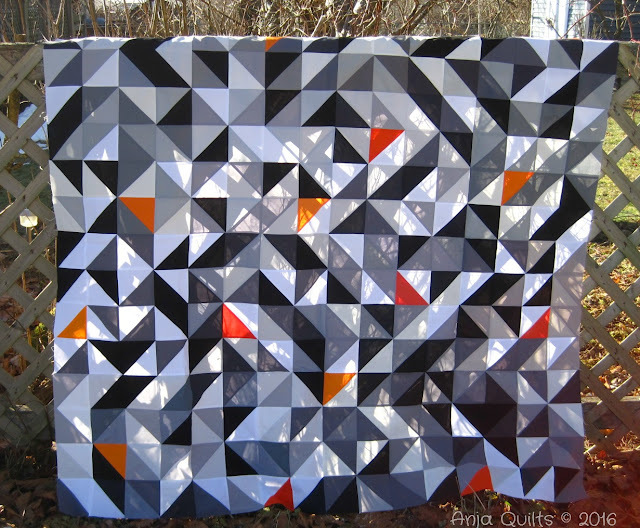 The wind was so strong, the quilt blew to be horizontal with the ground. This was my last Q4 goal for Finish Along 2016. 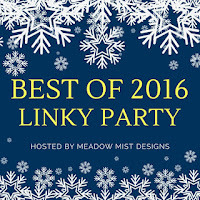 Cheryl @ Meadow Mist Designs is hosting Best of 2016 Linky Party. 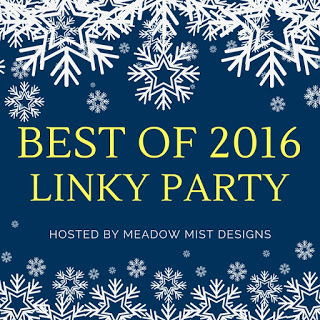 It's an opportunity to highlight your best five blog posts from 2016. 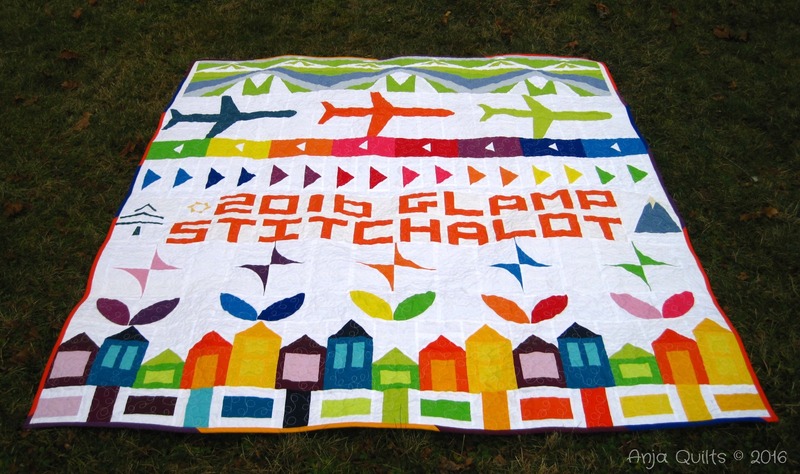 This quilt is a reminder of my adventure at Glamp Stitchalot 2016 in Ann Arbor, Michigan. 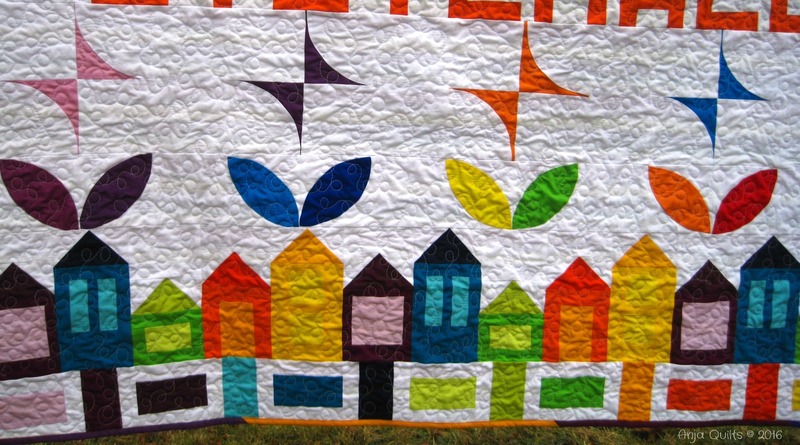 This was my first non-local quilt retreat. I procrastinated about making this bag because I thought it would be difficult. 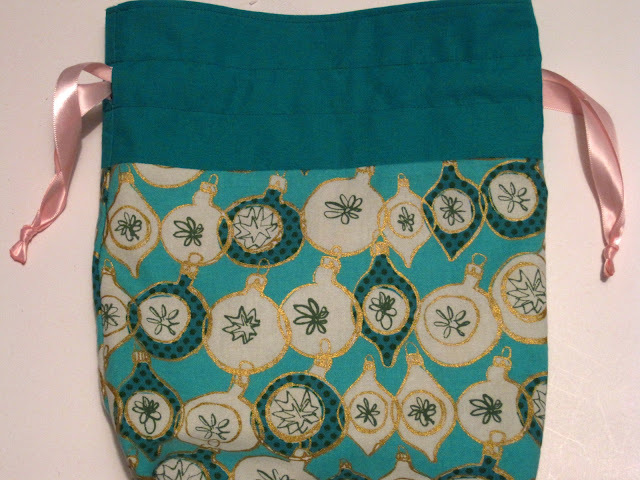 With the exception of the side pieces, this was a fairly easy bag to make. This was a great QAL hosted by Yvonne @ Quilting Jetgirl. 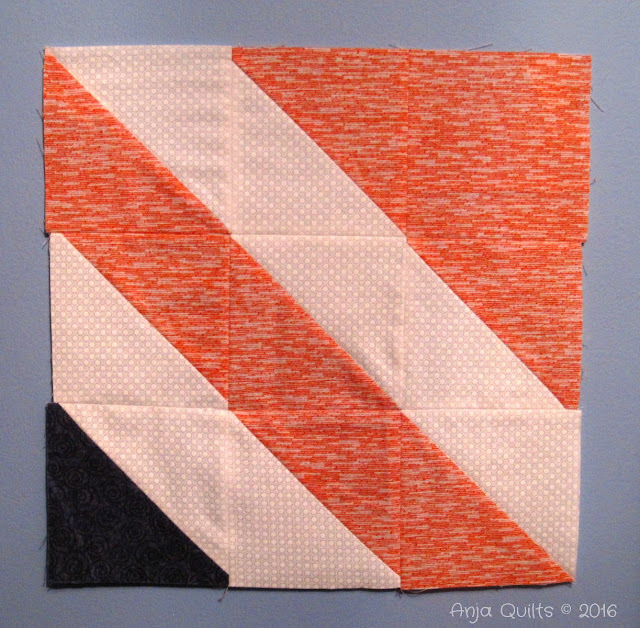 All fabrics were from my stash, and I used a variegated Aurifil thread for the quilting. Riding a high from learning some helpful paper piecing techniques at Glamp Stitchalot in June, I decided to make a Violet Craft paper pieced pattern for our guild paint chip challenge. 2016 was a great year. I wonder what 2017 will bring? 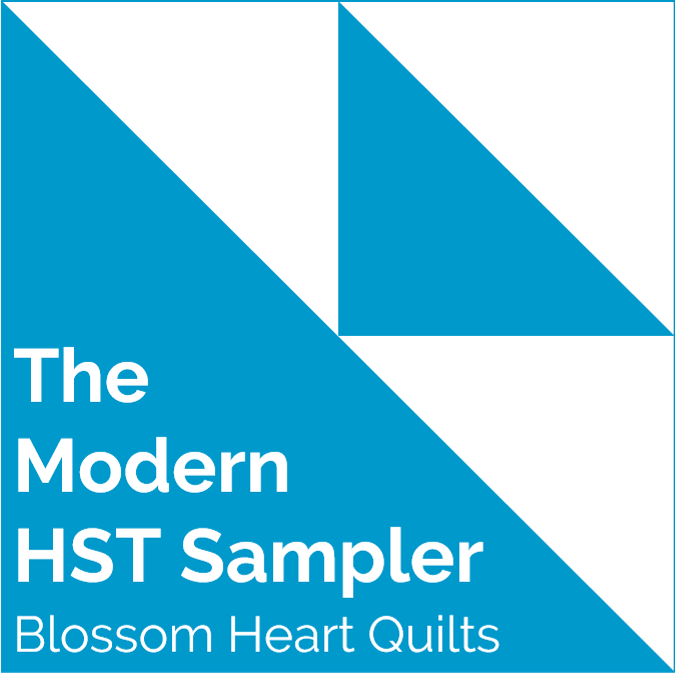 The Modern HST Sampler hosted by Alyce @ Blossom Heart Quilts started back in January. 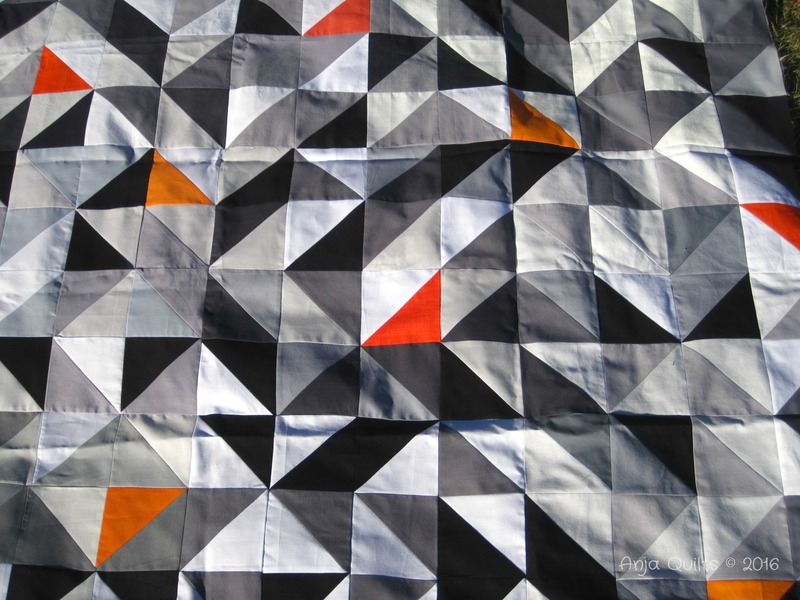 One new block was released every two weeks, for a total of 24 blocks. 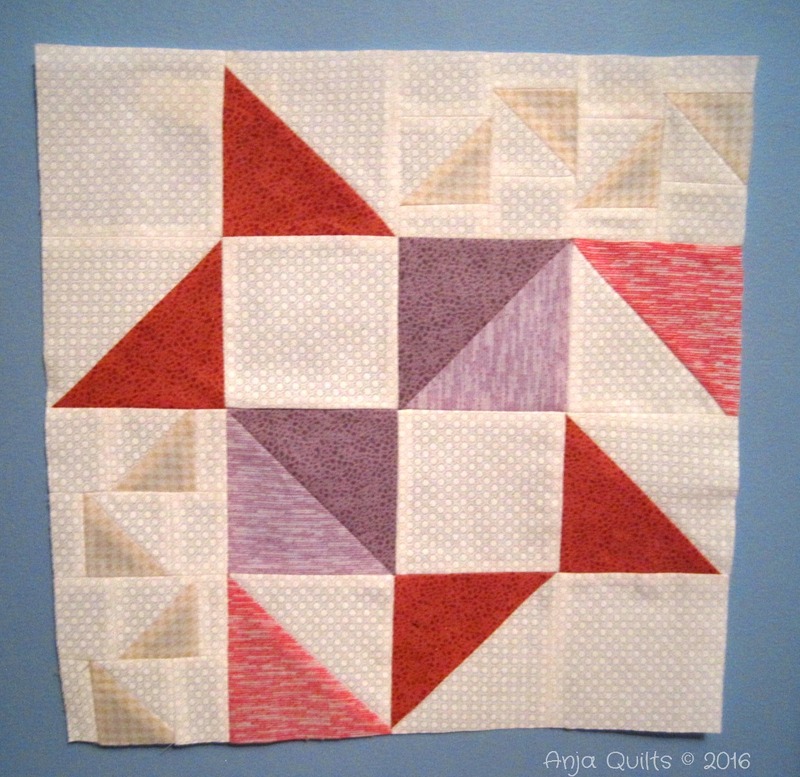 It's been quite the year -- learning various ways to make HST's. Not a big surprise -- I hated the 2-inch HST's (finishing at 1.5 inches). 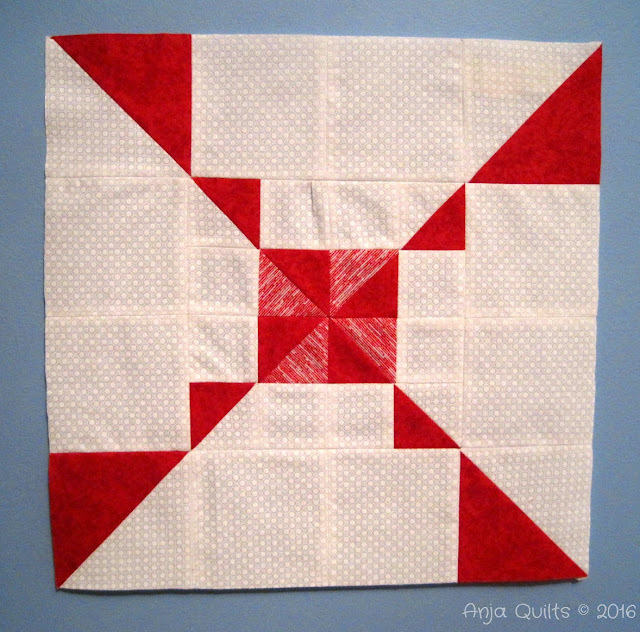 Here is Block #24 - Nip Tuck. 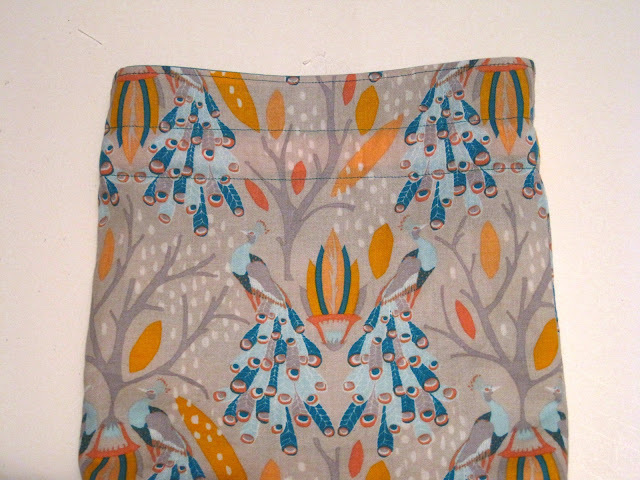 I used leftover HST's and scraps of fabric. When I laid out the 24 blocks, I decided I needed another block to do a 5 blocks x 5 blocks layout. 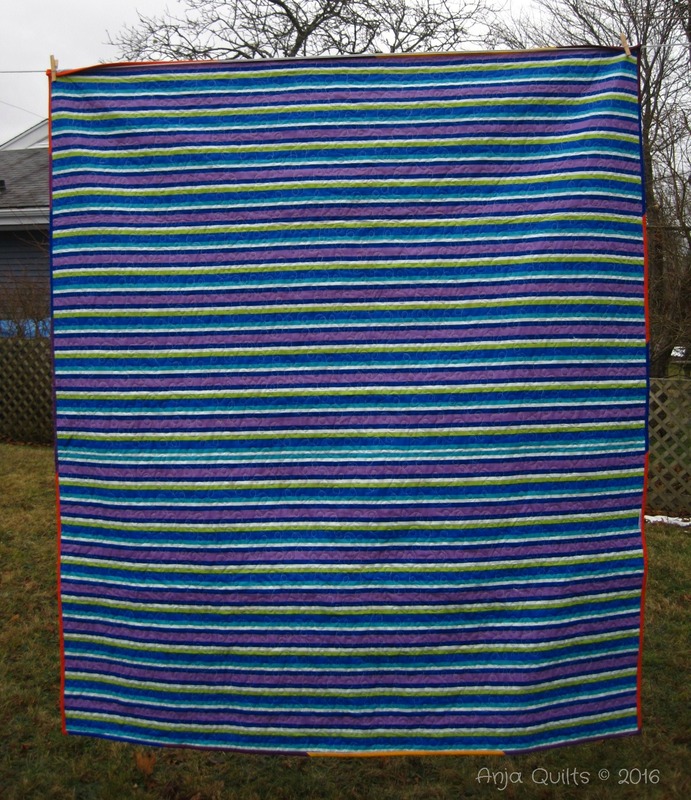 I had very little of my background fabric left, so had to be creative. I couldn't even scrape together enough background fabric to make another HST for the top right-hand corner. And here are all 25 blocks pieced together. 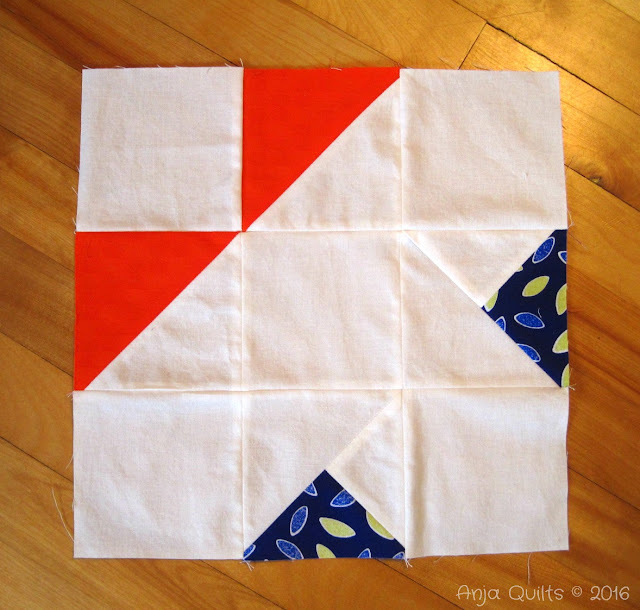 I didn't want to introduce another fabric for sashing (I used fat quarters for the blocks), so I just tried to spread around the colours as best I could. This QAL was a great learning experience. I'm glad I played along. I haven't been as productive as I had hoped this holiday week, but I have high hopes for the rest of the week. This finish has been a long time coming....six months to be exact. 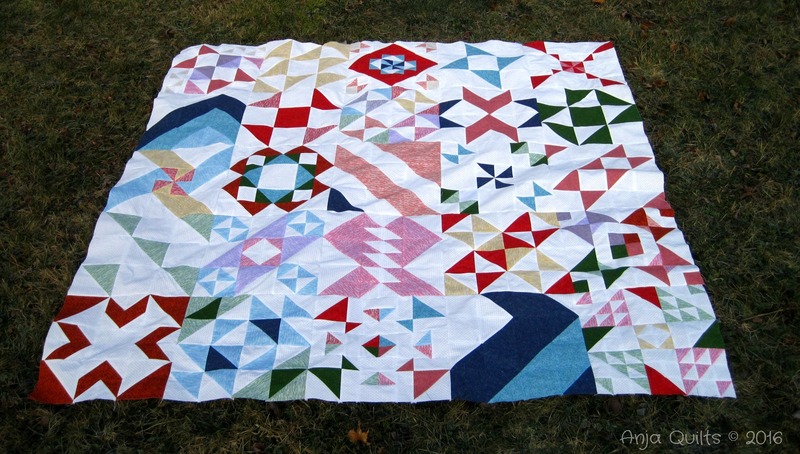 And sadly, it's not the oldest WIP in my stash. Ta da!! 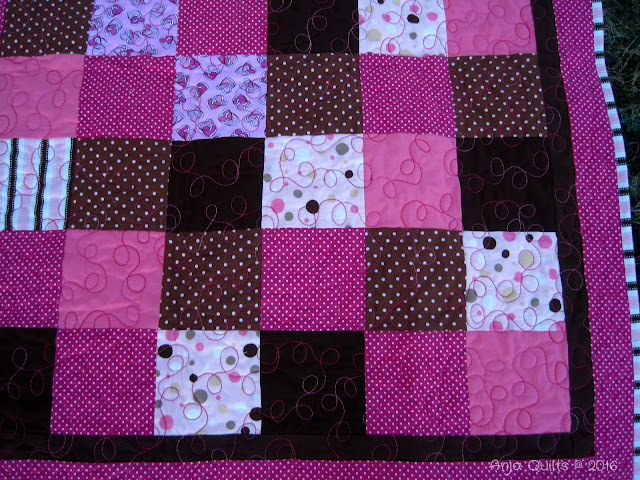 Simple loop free motion quilting for a quick finish. Some close up photos of each of the rows. 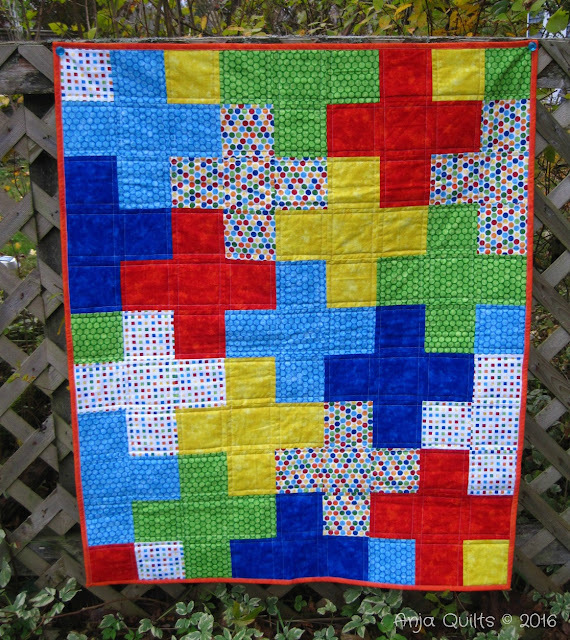 Another quilt for me. I need to create a rotation system so all these quilts get used. This is the second of my FAL Q4 Goals. I've got one week to finish the third and final one. Not sure I can do it, but I'm going to give it my best effort. Merry Christmas. I hope you and your family have a wonderful relaxing holiday season (hopefully with some quilting thrown in the mix). 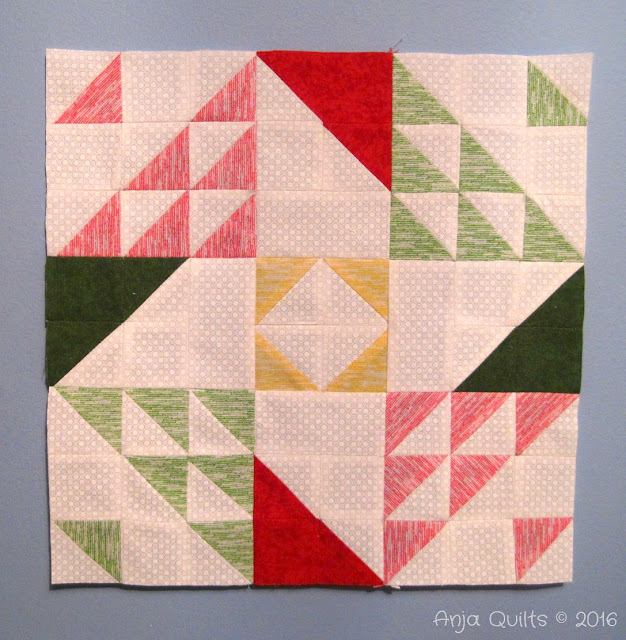 You may remember my Stash Bee blocks that I shared back in October. I made some additional blocks and now have a finished quilt top. I love those pops of orange. I'm not sure how I'm going to quilt it, but thinking maybe curves or loops in grey thread. But I have some time to think about it as it's currently on display at my LQS for the class on HST's I'm teaching in January. I can't wait to cuddle under this quilt. I was a little delayed in making a quilt for my new baby cousin...a year delayed to be exact. Oops. Better late than never I guess. 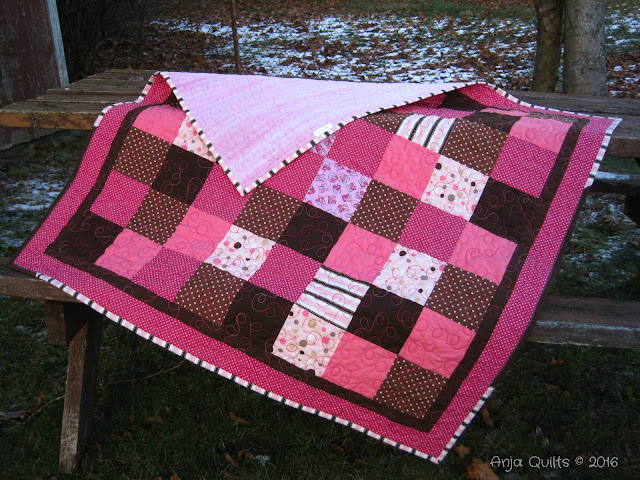 It was difficult to capture the true colours of all the pinks in this quilt. When does Spring arrive??? Loop free motion quilting in pink variegated thread. You can see bits of snow in the background. Sadly Winter arrived with a vengeance this week. And it's about -15° (and with windchill, it feels like -25°). And that's Celsius my friends, not Fahrenheit. It was so cold today that it hurt my face. Now I have to go outside and shovel the driveway...sigh....I am sooooooooooo not a Winter person. It's been fun playing along with the Meadow Mystery Quilt Along hosted by Cheryl @ Meadow Mist Designs. 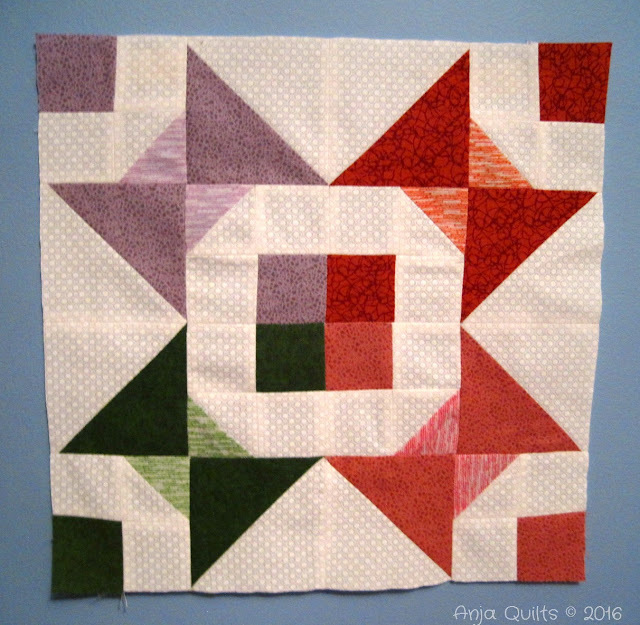 Here are my December blocks. There is only one of this type of block. 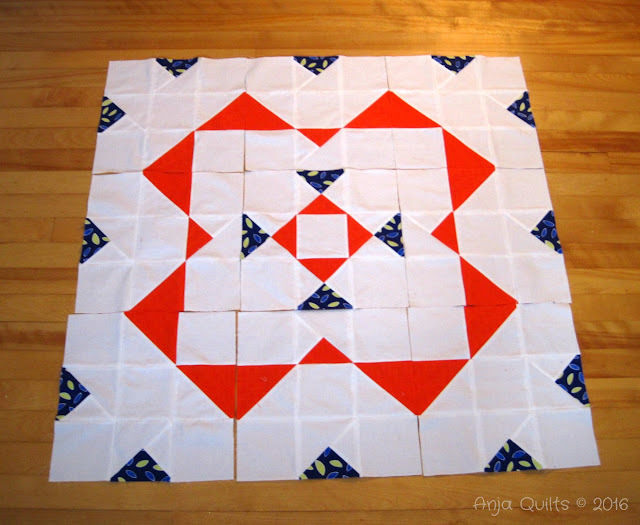 I have no idea where these blocks will end up in the quilt, but I decided to play with some layouts. 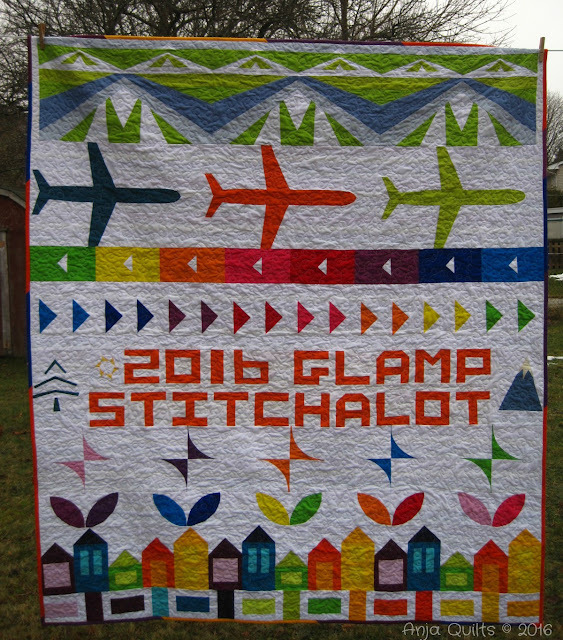 Patty @ Elm Street Quilts is hosting Bag It 2016. 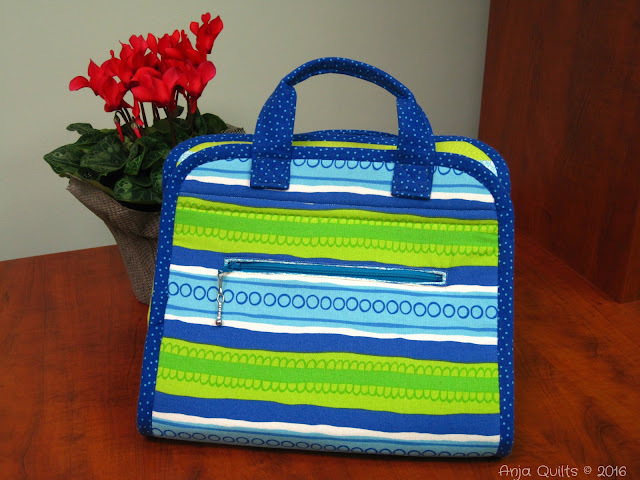 Patty shares a lot of great bag tutorials. 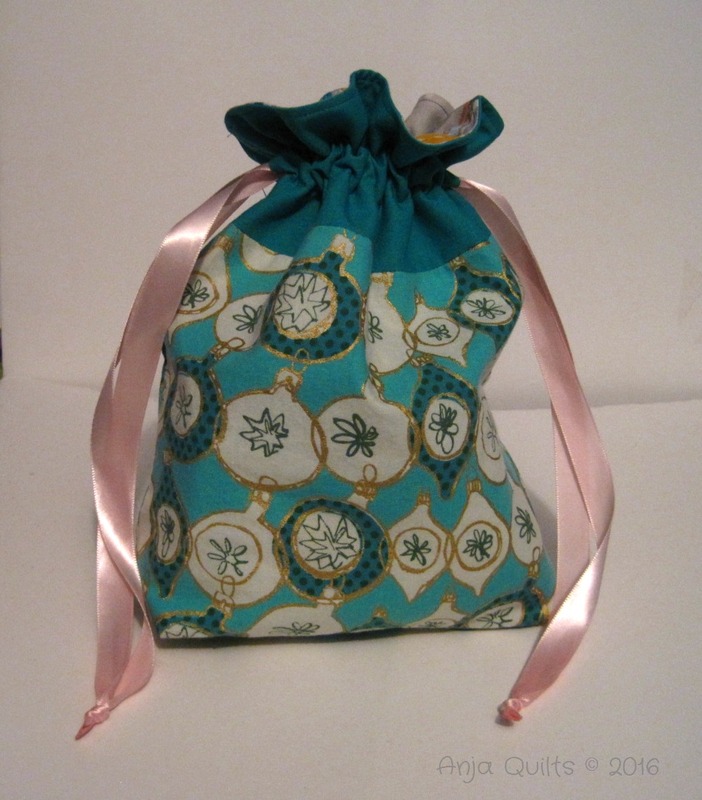 I thought I'd make a drawstring bag for a Christmas gift instead of buying a gift bag. 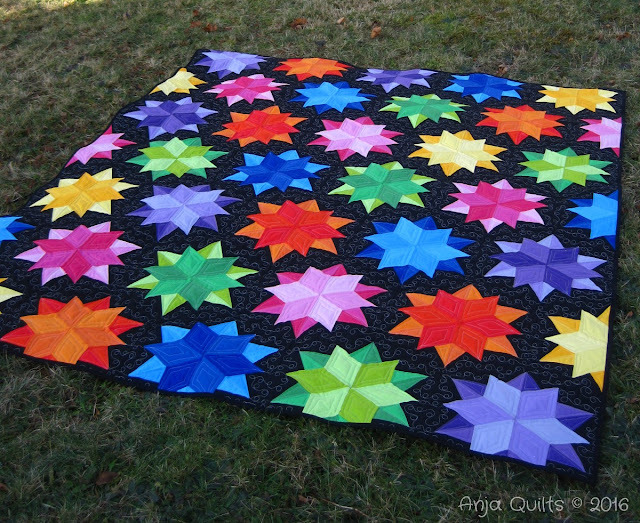 I love this pattern from Jeni @ In Color Order. 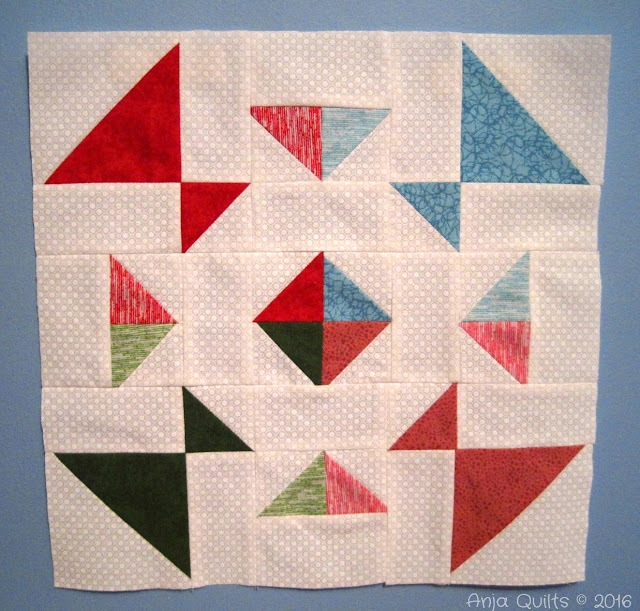 I love this Cotton + Steel Christmas print. And this awesome print for the inside. 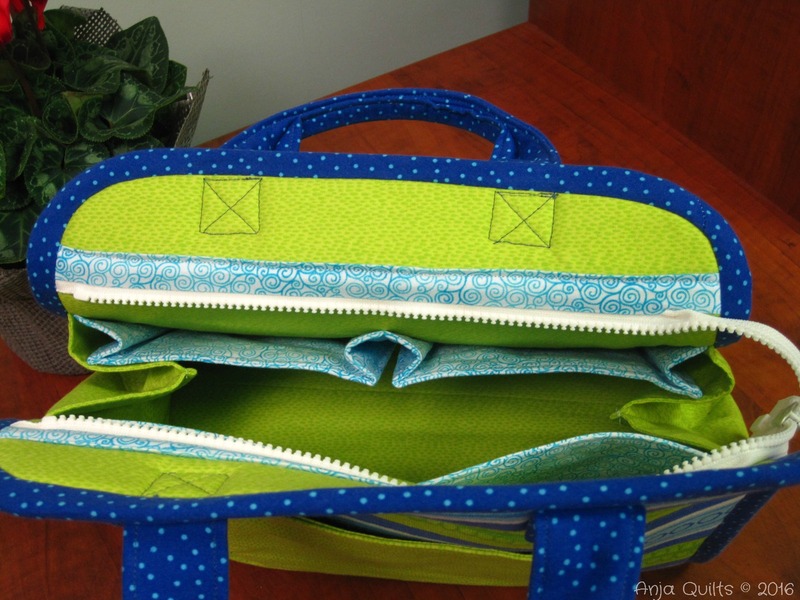 You have until Friday to link up any bags you've made this fall. Patty has some great sponsors for prizes. Welcome to another Thank Goodness It's Finished Friday being hosted here on the East Coast of Canada. I'm looking forward to seeing all your finishes from this week. So I'll get the party started with my own finish. Way back in May, I played along with May is for Makers and purchased five great patterns (which you can read about here). I finally have my first finish -- a Maker's Tote by Anna @ Noodlehead. This is also my first finish of my Q4 goals for Finish Along 2016. It was a little difficult sewing in the side sections. It's definitely not perfect, but now that I've made one, I know what to do and not to do next time. Now it's time for your finishes. 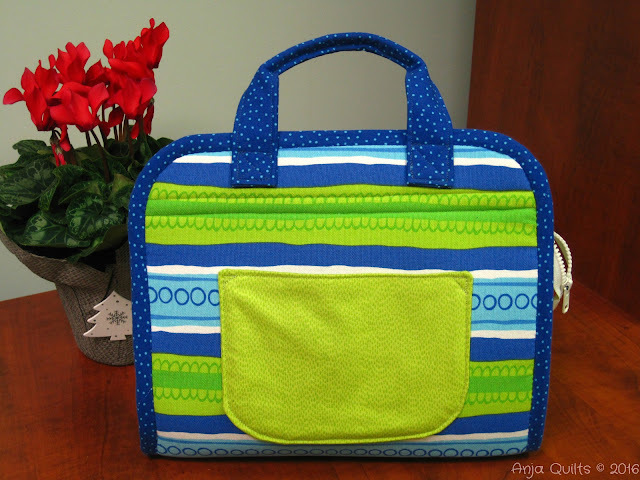 Link up your blog post showing off your finished project using the linkup below. 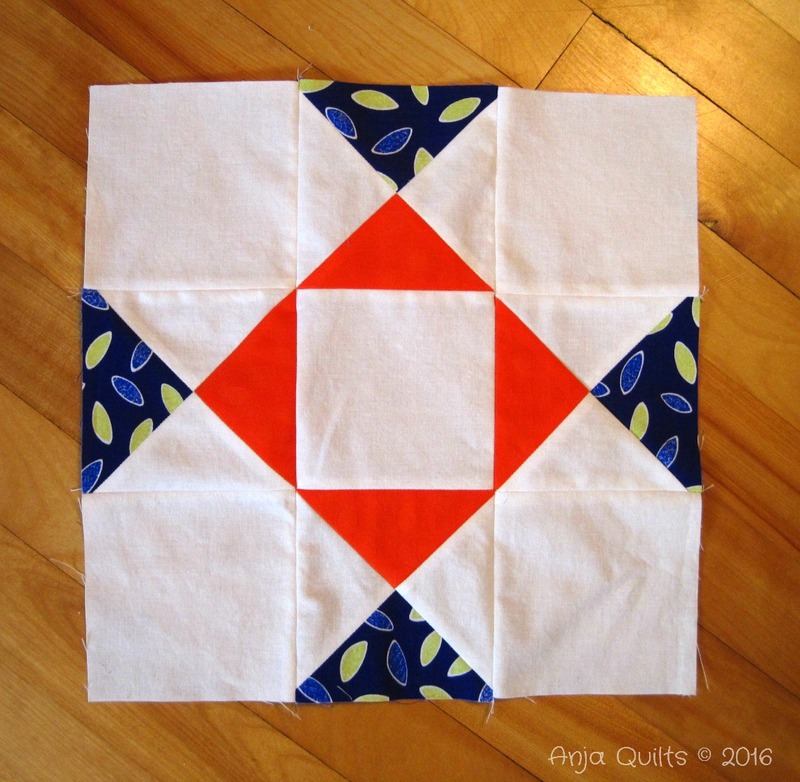 Don't forget to visit a few blogs to spread some quilty love and encouragement. 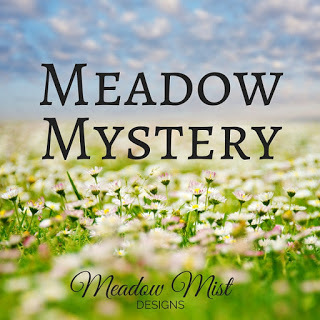 Please include a link and/or the TGIFF button in your blog post so your followers can also view all the great finishes. I'm caught up!! A couple of nights of assembly line production, and I'm up to date with my Modern HST Sampler blocks. Just one more block to go. 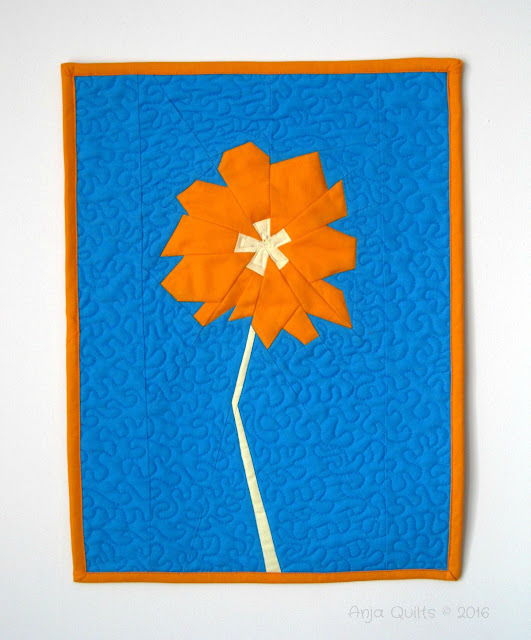 Alyce @ Blossom Heart Quilts has been hosting all year long. You can find all the tutorials here. 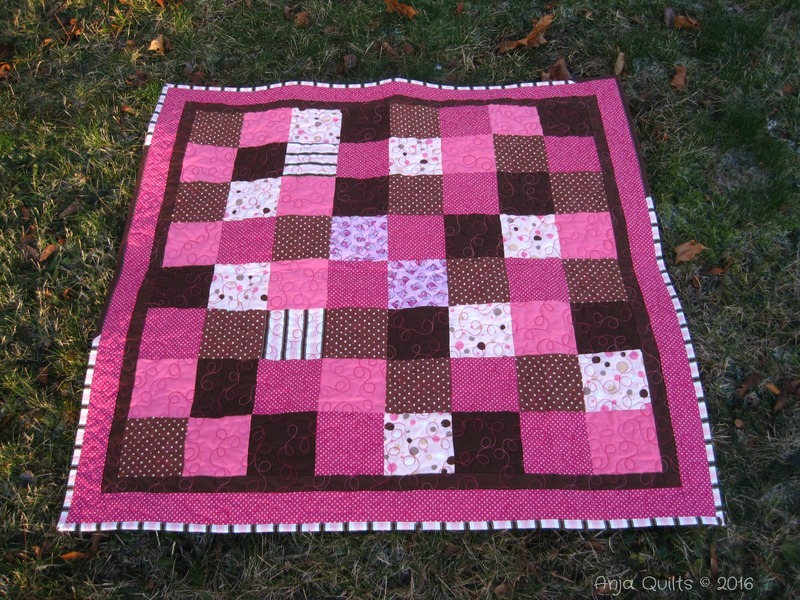 I need to start thinking about possible layouts and a quilting plan. Stop back on Friday when I'm hosting Thank Goodness It's Finished Friday. I'm looking forward to seeing all your finishes.